The Life of Bon: Chick-fil-a drive thru breastfeeding. It's a thing. Chick-fil-a drive thru breastfeeding. It's a thing. The weirdest things are happening. Greg wants me to watch Bachelor in Paradise with him. He is literally sitting here asking me if I am almost finished with my post so that we can finish the episode. It's a weird world. Speaking of weird world. I had a bunch of errands to run today. Oh, errands! They are going to be the death of me. Get the electricity switched to our name, put down a deposit so the city will give us a garbage can, return library books, get June on to my insurance, pick up mail keys. The errands never end! I was at my school district office in the middle of a riveting conversation about flex spending and how to switch June to my insurance for a measley 45 days before we switch her onto Greg's insurance (It's a freaking circus!) when June let out one of her barbaric cries that means it's time to eat. Time to eat right this second, damnit! I know her cry well. My next stop was supposed to be the school to work on a bunch of sub plans. I thought I would feed June there, in the comfort of my quiet classroom, no problemo. Well. Actually there was a problem. First I needed to eat. I don't mean to put my hunger in front of my child's, but let's face it, it takes June an hour to eat lunch and it takes me close to seven minutes. I win. Chick-fil-a is right across the street from my school, so a quick trip through the drive thru before I hit the school was to be my ticket to cure my hunger. June usually calms down in the car, but she wasn't having it today. I about had an ulcer when I saw the line- probably 20 cars in line for a little bit of chicken. I considered going somewhere else, but at this point I just wanted to get my food and be done with it all. The dude came out to my car to take my order, June screamed bloody murder, and it was then and there that I knew I had no choice. As soon as the guy was gone, I whipped June out of her carseat and began to feed her while we inched slowly forward in line. It's not going to win me mom of the year, but we were going at most two miles an hour and that child needed to eat. Sue me. The highlight of the whole experience came when I finally arrived at the window to pick up my meal. Who should appear to hand me over my nuggets and fries but a former student?!? "Oh, hey Mallorie!" I exclaimed much too excitedly and over zealously. You know how you get when you're nervous and maybe caught doing something you're not supposed to and start talking in a high pitched over excited voice? It was that. Mallorie looked at me with that apathetic look that is so typical for teenagers, and then glanced questioningly at the apparent bundle of blankets in my arms. "Oh you know! Screaming baby!" I quickly tried to explain. She obviously couldn't have cared less, but I attempted justification anyway. "I couldn't wait for the line! Had to feed her now! This little five pound sucker has got a pair of lungs on her!" "Cool. So you had your baby?" She asked, semi interested. "Yep! Had the baby! Gotta go! Thanks Mallorie! Love my nuggets!" I chimed like the hot mess I truly was. I put the car in to drive and inched my way into the nearby parking spot. Forty five minutes later I emerged to change June's diaper, restrap her in a car seat, and throw away my empty chick-fil-a bag. Mallorie waved from the now empty window. "Good luck, Ms. Larsen!" she yelled. Thanks, kid. I'm gonna be needing it. See you on the first day of school? Now. (Enter smooth transition sentence here.) Before I bid adieu to you all tonight, I've got eight ladies who have pooled a bit of cash together to give you some back to school spending money. 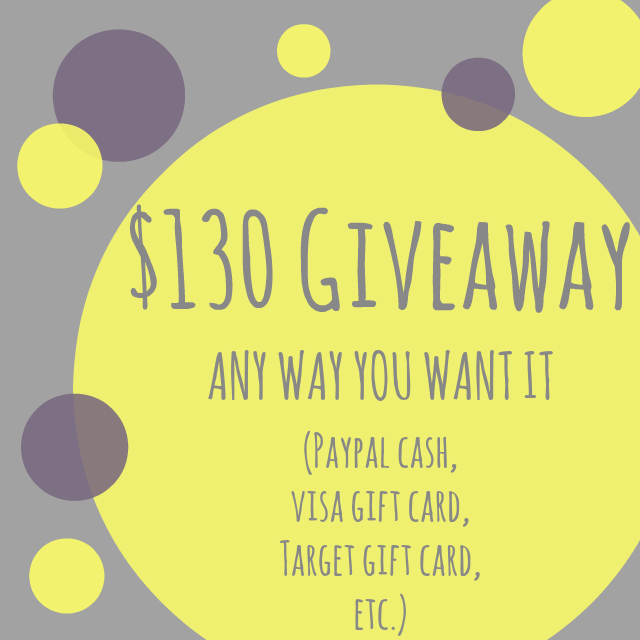 $130 is up for grabs in whichever form you want- via Paypal, Target gift card, J. Crew gift card, the sky is the limit! Entering is super easy so get going! If you're anything like me you might spend the whole dang wad on lunch at Chick-fil-a! Hey, we can dream, can't we?!? Giveaway ends August 19, 2014. All entries will be verified. Giveaway open to international readers given they are able and willing to accept the prize money via Paypal. I'm dying over this story. I feel like that is so something that would happen to me! new reader here and 1) congratulations on your sweet baby 2) congratulations on winning the 'quickest eating contest' because my meal is always gone before my husbands and 3) fantastic recap of interacting with a former student while feeding your babe! love it. hilarious. new fav. I once nursed squeezed in the back middle seat while my husband drove, following our realtor to look at the next house on our list. I probably shouldn't admit to that. . . But at least we have a place to live now. Best new momma story I've heard in a long time! You got moxie Bon. Keep it up! HAHAHA. This cracks me up. That will so be me one day. I'm sorry you had a rough day though. But Chick Fil A is the bomb.com. I think they put crack in their nuggets. Oh, that is hilarious! Sometimes I think that when we most want to not be seen doing something, our chances of bumping into someone we know rise exponentially! I think you're fine, though. Do what you gotta do! hahaha you are hilarious! I'm sure Mallorie didn't even think twice about it. :) too funny! This is too funny!! I can only imagine the stories and situations that will arise when I have my first baby lol! That is too funny! You gotta do what you gotta do, right?? Great giveaway, but on the form under the entry to follow "When You're Making Plans via GFC" on that page there is no GFC. Hello! Was the giveaway winner ever announced?